ever listen to a song - a song you hated instantly. presto. the above in 1990 was just that for me. however, it has grown on me. i like its simplicity. the original song is a-cappella, however, the one i've mentioned is the dance remix with DNA. i also just heard it on the XM Radio, on my way home from a parent/teacher meeting over at TDMcGee Catholic School. 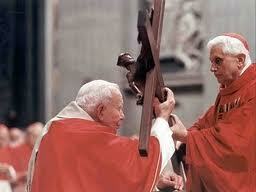 today is the Feast of the Exultation of the Cross. after celebrating mass in the morning, i usually have time to read some of the news sipping on my coffee. i also scour and sift through many blogs - many of which mention the beautiful prayers, verses and origins of this feast. none, however, got my attention today. as a child i never knew what to do with the Cross? who was this person on the Cross? why was He there? i had difficulty looking at the Cross! over time, and much grace, i can now admire its simplicity! what was once foolishness, and a scandal to me, has now become my very identity. in the words of St. John Chrysostom, the Cross is the will of the Father, the glory of God, and the joy of the Holy Spirit. whoever follows Our Lord Jesus Christ, is called to embrace the Cross. simple. not always. i remember that those who follow Our Lord do not have to seek out the Cross - for indeed, the Cross will find you! miscommunications. misunderstandings. martyrdom. sometimes, and some days, it seems that nothing goes right. why is that? all i'm trying to do is to make You known and loved by all. today i embrace the Cross, anew. the Cross is more radiant and beautiful than the sun in the sky. now, off to prepare for school masses at Lester B. Pearson Catholic High School, wedding rehearsals, and our new sacramental preparation journey for our children. peace.